Intelligent city planning methods and e-tools provide guidance and analyse the steps that need to be taken in order to plan and implement a successful smart city strategy. As an overarching methodological framework, at URENIO Research we have developed the ‘Roadmap for the Intelligent City’, which comprises three distinct stages and seven steps towards the realization of the intelligent city. The first stage examines the components of the smart city (urban system / innovation system / digital environment). 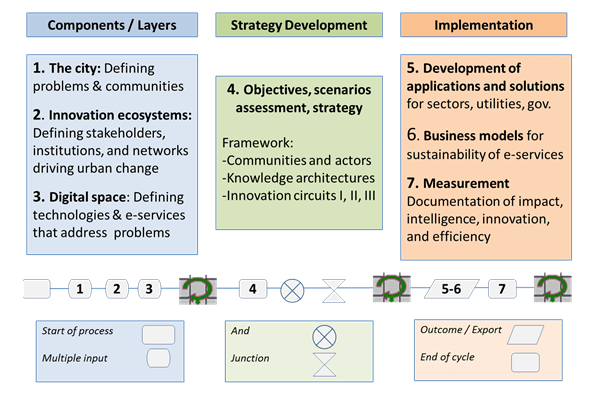 The second stage addresses the integration of the previous components in a strategic framework. The final stage regards the implementation of the smart city strategy, including the development of digital services, business models, and measurement scoreboards. This approach serves the development of digital applications that respond effectively to urban problems and challenges, while it simultaneously encourages the participation and collaboration among the smart city’s stakeholders, leading to the development of highly effective smart city solutions and services. Parallel to the roadmap, we have developed about thirty online applications and e-tools that support the creation and implementation of smart city and regional innovation strategies. These span the areas of Governance (web-based tools for vision creation and stakeholder engagement), Analysis of Context (tools for profiling, infrastructure mapping, innovation ecosystem mapping, benchmarking, scientific production profiling), Strategy formulation (tools for collaborative vision building, scenario development, foresight/Delphi), Priority Setting (focus groups application and tools for analysis of extroversion and related variety), Policy Mix (action plan co-design tool, budgeting tool, calls consultation tool, innovation maps application, open data tool), and Monitoring & evaluation (monitoring application, balanced scorecard tool, stakeholder satisfaction monitoring tool, social media analysis tool). a set of innovation management tools and methodologies in the form of online roadmaps, marketplaces, virtual collaboration environments etc.